Developers hope to have the Braemar’s World Highland Games Centre completed in time for the annual Gathering in September – where it will be officially opened. Last year, planning permission was granted for a the site at Braemar – the first purpose built attraction of its kind. Incorporating a gallery, exhibition hall, cafe and gift shop, the centre will tell the story of royal links to the village and of the early beginnings of Highland games across Scotland. 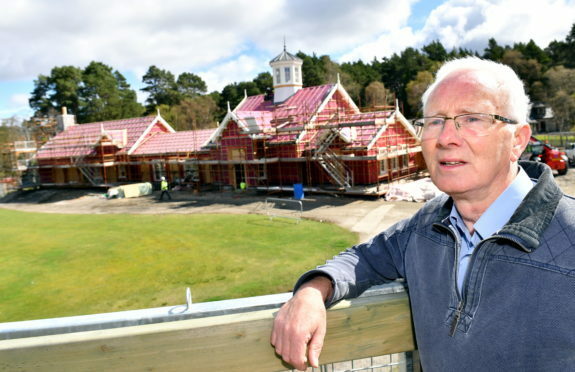 President of Braemar Royal Highland Society David Geddes was on site yesterday to see how progress was going, he said: “We are slightly behind schedule, but are still on track for the main building to open in time for this years Braemar Gathering. The building is being part-funded by the Duke of Rothesay’s Dumfries House Trust, which has contributed £250,000 and also by a substantial £500,000 donation from local hotelier Mr Iwan Wirth. Mr Geddes confirmed that the remaining funding had been committed from the Braemar Royal Society charity and “many other generous funders”. The new structure is situated near the entrance to the Princess Royal and Duke of Fife Memorial Park. The building will also house a Hall of Fame of the games’ past sporting heavyweights featuring Bill Anderson MBE who is still one of the true giants of Scottish sport, and perhaps the greatest Highland Games champion the world has ever seen. The Aberdeen father-of-four dominated the games for more than 30 years, collecting 16 Scottish titles and hundreds of trophies before retiring in 1988. This year’s Braemar Gathering will take place on Saturday September 1.